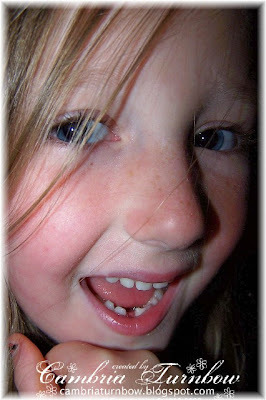 Ever since Kindergarten as her friends were losing teeth, and every time the boys would lose another, she'd say, "look Mom, I have a loose tooth too". She'd put her finger over her tooth and wiggle it back and forth. I didn't want to disappoint her and tell her that the boys were all late losers.... that they were in the first grade, almost second before they lost their first teeth. So, the other day, we are in the van, and she screams, "OH MY GOSH..... It's LOOSE!" I'm thinking her car seat was loose. Steve and I quickly look back and she has her finger in her mouth and was smiling SO big. "Really, for real this time Mom... it's loose..... LOOK!". Sure enough... it was indeed lose and wiggling back and forth. I said.... "I KNEW you had been teasing me... you just busted yourself." She just smiled. Then, we had to show and tell everyone how loose her tooth was. She wiggled it back and forth so much that is was sore that night. Two days go by and the tooth is getting REALLY loose, even though her brother offered to yank it out for her, she wanted it to come out on it's own. This morning she comes in to my room and says "Mom... look (with a big ole grin)" My husband says "A.... it came out? You lost your tooth?". She said, "Yah, it came out and then went right down to my tummy with my Rice Chex....will the tooth fairy still come?". OMG, trying not to totally laugh.... I convinced her that I was sure we could write her a note and explain what happened. I HAD to take a photo with my phone and text it to some friends. Since Verizon finally came to our small town, I've been a texting/photo sending fool. I love sending texts and photos! I swear, I'm as bad as the kids. So, my friend Val and I are always sending photos to each other.... of whatever we are doing at the moment. I get a text back from Val and it says, "Yeah... and whoops..... is she going to wait for the toot fairy?" OMG, I spit my coffee. THE TOOT FAIRY! Oh, I love ya Val from Cal... my texting buddy! So, all day, Averie has been telling everyone that the TOOT fairy is coming tonight! I think I'm going to make the toot fairy a cute scalloped envelope with my new SU! die for her note...... I wonder how much a swallowed tooth is worth? Ha... so, just wanted to share. Thanks to the Toot Fairy, I have a very happy girl tonight.... missing tooth and all. I'm working on the laundry this weekend, but hopefully tomorow I'll get some time to stamp. Hope you are having a great weekend.... thanks for stopping by! Paper: Georgia Peach Designer Paper, Tangerine Tango, Whisper White. Ink: Stampin Write Markers, Regal Rose, Old Olive, Copic Markers (background with the Airbrush System). Other: Crafter's Tool Kit, Top Notch Die (SU! ), Nesties, Big Shot, Cuttlebug With Gratitude, Old Olive Brads, Banana Brads, Fairy Tale Ribbon Originals, Dimensionals, Scallop Edge Punch, Janome Sew Mini, Scor-Pal, Copic Airbrush System. Okay, so I am on coundown... I'm not kidding, only a few more days and the kids get on the bus baby. Everyone is excited to go back to school. I think we are going to stay home this weekend and just hang out, get the laundry caught up and get geared up for school. I'd love to get some stampin done, but I'm not counting on it. Hope you have a super weekend! Enjoy that extra day off!!! Hello stampers! I found some cool new stuff! I haven't had much time to play, but this is what I threw together with an image that I colored in awhile ago. The stamps are from a mini set called Patio from Hanna Stamps. Ha... that would be just like me to set down my drink, then not remember where I put it later.... or better yet, a bug or something would fall out of the plant and mix in with the ice cubes! I'd take a drink before I noticed, then I'd have to scream and run around spitting out my drink to irritate the heck out of my husband. He hates it when I scream..... unless I'm dying. But, if I had swallowed a bug, I'd HAVE to scream...ew! Oh.... back to the card and the cool stuff... sorry. So, have you seen the new Cuttlebug stuff? DANG, had to order more embossing folders, but now they have embossing strips! I'm not sure that is what they are called, but they are COOL. See them here. Okay, so they are called borders. LOVE the new borders!! I used the one called Frills to do the embossed flowers down the side and bottom. See the words? OMGosh.. how cool is this? You get an embossing folder, AND the die cut sayings! I used the one called Friends Forever. I NEED more!! I'm SO digging these new things from Cuttlebug!! Okay, my other new thing is the new colors of Shimmerz Paint! Beeswax, Rustic Red, and Sagebrush.....ooooooo aren't they gorgeous? I used the Sagebrush in the tree and the Beeswax for the drink and the bird seed. I also used the Angel Wings for the beard on the.... what do you call those yard things? Yah, that elf dude. Okay, so my kids are thinking they need to eat AGAIN. So, I'll be back later to include the recipe. This week, we are busy getting ready to start school. Today the twins have their annual eye exams. Baylor is being fitted for contact lenses. His brother got them earlier in the year because he cannot keep his glasses... they disappear into a black mysterious hole never to be seen again. He's done really well with them, and wouldn't ya know it, he can see. Seeing is a good thing in the 6th grade right? Baylor's glasses look like he's been in a war zone and even he is embarrassed to start school in them. So, today is the day, he is thrilled to start wearing contacts just in time for school. See ya later friends, thanks for stopping by! Oh, I love easy cards. I'm going to use the heck out of the Top Notch Big Shot die from SU!. The top portion of the card was left over scrap piece. You can always use up designer paper right? OMGosh, I LOVE all the new designer papers in the catalog. This one is called Sweet Always. It is, indeed, SWEET. Sorry... I get off topic. LOL. 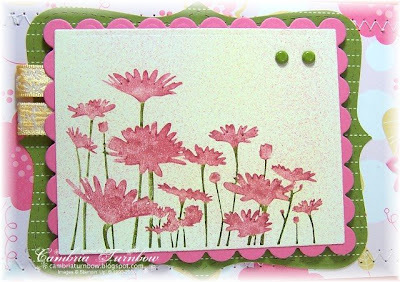 Stamps: Eastern Blooms, Heard from the Heart. Paper: Sweet Always Designer Paper, Whisper White, Regal Rose, Only Orange, Chocolate Chip. Ink: Close to Cocoa Craft. Other: Brown Poly Twill Ribbon, Dimensionals, Crafter's Tool Kit, Scallop Edge Punch, Top Notch Die, Big Shot, Filigree Brads, 1 3/4 inch Circle Punch. We had a wonderful family reunion this weekend. Averie LOVES her cousins. They are SO sweet to her. They painted her nails, brushed her hair, went tubing and swimming over and over with her. The boys too... they love hanging out with their boy cousins getting all dirty fishing and playing. Baylor caught a beautiful Trout and his cousin Cody caught THE biggest bass... it was awesome. I wish they didn't live so far away... it's really nice getting together with them. One more reason to look forward to August each year though right? Hope you all had a super weekend. Thanks for stopping by! Okay, so I've had a lot of questions lately about the photos on my blog. You will probably think this is funny, but I do not do anything special. Someday, I will invest in one of those fancy photo cube thingies, but for now, this is what I do. 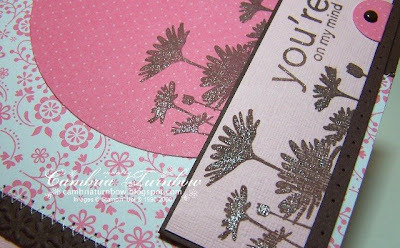 You know the sheets of cardboard that come in the back of the designer packs of paper from Stampin' Up!? I use two of those, on a chair in front of a window! I'm not kidding. It works best when you can get as much natural light as possible.... which sometimes is a real challenge here on the OR coast. I also have a light that I turn on with one of those natural light bulbs in it... you know, one of the twirlie ones? You can get them at Walmart, BiMart... pretty much wherever you shop. They are around $5.00. I set up my card in the center of the bottom piece of cardboard. I then back up and hit the macro setting on my camera. I zoom in a bit, but not too close, because I crop later. I take about 6-8 photos moving the camera slightly each time. I then upload them to Microsoft Picture It! It's a program that came with my version of XP. I usually hit the auto fix, but sometimes it makes the colors funky so I will go and fiddle with the brightness and contrast a bit. I don't like to fiddle too much though, because then it's me that makes it too funky. I then crop it , and add a feature called soft. It makes the edges kinda soft or fuzzy white. Then, I add my watermark, hit save as web ready photo, and hit save. I always get better photos on nicer, brighter days.... it's all the natural light baby! So, there ya have it. If you've got any tips or tricks to share, I'd love to hear them! I'm always looking for other options or ways to improve. Hope you had a super weekend.... thanks for stopping by! 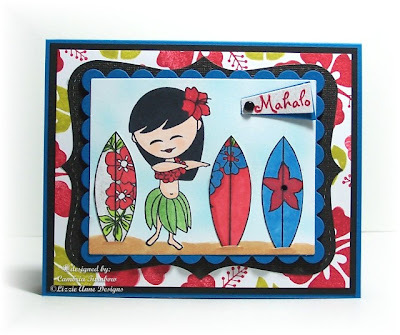 Oh, how I love this sweet hula girl from Lizzie Anne Designs. Doesn't it just scream summer... fun.... sunshine? Makes me want to be on a beach with a drink in my hand! I did all the coloring with Copic markers. I masked her with Eclipse Masking tape and made the sky and sand with the airbrush system. I cut little slits in the card stock and inserted the surf boards. Everything has an extra shazam with Shimmerz Paint. I used the colors celery, Royal Red, Sky Blue, and Angel Wings. 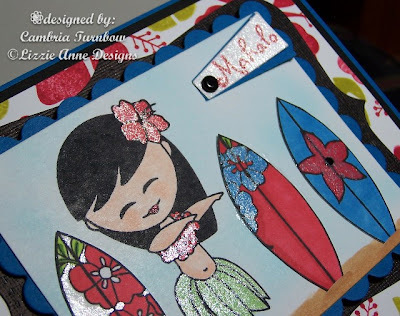 The little tag in the corner is a piece of card stock that I painted with Shimmerz Angel Wings, let dry, then stamped Mahalo, then cut out with a punch. Here is a close up of all the shimmer and shine. Can you see it now? LOL. It's really like nothing I've used before and the more I play, the more I LOVE this stuff! Paper: Basic Black, Neenah White, Pacific Point. Ink: Ranger Distress Soot Black, Copic Markers, Riding Hood Red, Kiwi Kiss. Other: Shimmerz Paint, Nesties, Cuttlebug, Big Shot, Big Shot Label Die (SU! ), Old Retired SU! Punch (what is that name of that one?) Vintage Brads, Crafter's Tool Kit, Scor-Pal. Hope you have a super weekend! See you tomorrow! Whooo Hoooo, welcome back Beate! Dang.... having you on break makes the summer LONG! Missed ya girl! I'm so excited to get back in the groove baby! Of course, I have a few more weeks before I get to send my kids on the big yellow bus, but I'm going to make sure I don't miss any weekend sketch challenges! Love the sketch Jenn... and I can't wait to see what the rest of the team has been creating! You can check out their projects by clicking on their names. Hope you can find some stampin time to play along with us! Paper: Textured Pink Pirouette, Sweet Always Designer Paper, Chocolate Chip. Ink: Craft Close to Cocoa. Other: Coluzzle, Crafter's Tool Kit, Cuttlebug, Embossing Folder (with Love Borders), Dimensionals, Circle Punch, Pink and Brown Heidi Swap Brads, Coffee Shimmerz Paint, Aquapainter, Janome Sew Mini, Scor-Pal. I had to have stamp when I saw it. I think Taylor's little cupcake addiction is contagious. Also, I knew Averie's 6th birthday was coming up and these would be perfect for thank you cards. This one opens from the middle.... the top of the cupcake flips up. It's held down with a little BasicGrey Magnetic Snap Closures (love those things!). I will show you the inside and how they open exactly later.... I'm on a mission to get these done today before family starts to arrive tomorrow. I stamped the full stamp out on copy paper and I'm going to have Averie color them in and add the names and the thank you information. She LOVES to color and does a super job too! Averie had the best birthday. The weather was perfect. The boys are usually the ones who have friends up because they are older and I think parents are more likely to let them stay at the lake, so when she had all the girls around her, she was IN HEAVEN. My friend makes the MOST awesome cakes. 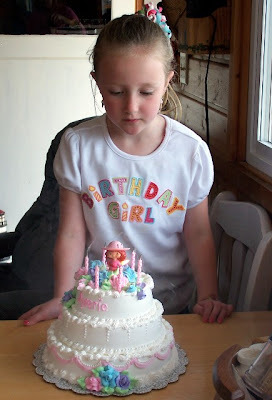 This is a photo of Averie with just HER cake.... we had a big one of our own to eat.... spoiled little girlie that she is. THANK YOU TRACY for the awesome cake! You really didn't have to make two! LOL... but Averie felt VERY special. Averie is always a little shy when it comes to everyone singing happy birthday to her. She concentrates on those candles! One more photo that I have to show you where you can really see the joy in her face. After swimming and tubing all day, they hop in the hot tub to warm up. It was so cute seeing all the kids splashing around in there. 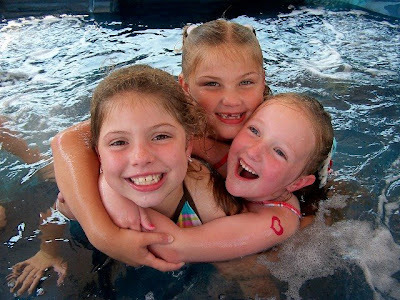 This photo is Averie with my friend's girls, Gracie and Cali and then Averie. They are just one and two years older than her, so she LOVES hanging with them and feeling like a big girl. Stamps: Simple Birthday Thanks, Say it with Scallops, Little Pieces, Cupcakes Roller Wheel. Paper: Regal Rose, Barely Banana, Georgia Peach Designer Paper. Ink: Ranger Distress Black Soot, Regal Rose, Craft White. Other: Crystal Effects (on the cherry), Die Cut Blooms, Circle Punch, Soft Subtle Brads, Crafter's Tool Kit, Grosgrain Ribbon, Square Scallop Punch, Square Punch, BasicGrey Magnetic Snaps, Dimensionals, Raspberry Liquid Pearls, Scor-pal. Have a super day! Thanks for stopping by! See you tomorrow for Beate's sketch! Hi everyone! So sorry for the lack of posting. I've had a couple of beyond crazy weeks and I'm afraid it's not slowing down. I got home from Eagle Crest and had one day to to all the grocery shopping and preparations for my daughter's 6th birthday party, then we headed to the lake for the weekend (and her party). This coming weekend is our family reunion so I'll be back up to the cabin on Friday. I did squeeze in a card this week. 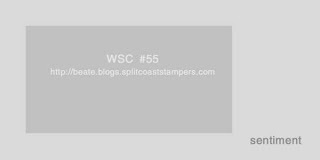 Having my new Stampin'Up! order had been KILLING me! I just had to make something or go completely crazy. 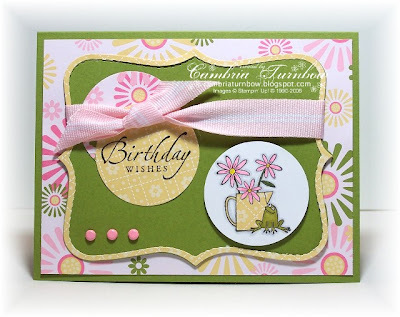 As you can see, I got some of the new exclusive Stampin'Up! dies.... oh, I'm excited about having the Big Shot! The circles are made with the new 1 3/4 inch punch. When you cut out the die, it has little perforations around the frame. I just used my craft knife and connected the lines to frame it with the designer paper. The main stamped image is raised up with dimensionals. The ribbon is the new Pink Pirouette Striped Grosgrain Ribbon. Paper: Old Olive, Whisper White, Georgia Peach Designer Paper. 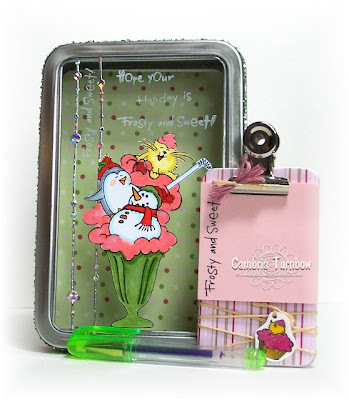 Other: Top Note Bigz Die, Big Shot, 1 3/4" Circle Punch, Crafter's Tool Kit, Soft Subtle Brads, Dimensionals, Craft Knife, Pink Pirouette Striped Grosgrain Ribbon, Crystal Effects (frog eyes), Scor-pal. My daughter had THE best birthday ever! (in her own words)... and she told her friends as her Dad pulled them in the tube, "My Dad Rocks". Oh, you should have seen him grin. I cannot believe she is six and starting school all day this year. I got to hang out with Lisa Mathis and her sweet family too! I haven't seen her since Portland Regionals so it was a real treat..... her kids are ADORABLE! Great friends, family and the sun was out to boot! Indeed a perfect day. I know I promised to share photos from Eagle Crest too, but I thought you'd want to see a card first since it's been a while since I got to stamp. Okay, busted..... my photos are still on my camera, but I promise to share soon. Hey... I got the card photographed.... I'm making progress. Hope you are all enjoying the last few weeks of summer..... and your new SU! goodies! I can't wait to catch up on things and visit some of my favorite blogs to see what everyone's been creating. Thanks for being patient and thanks for the emails... I'll be back full force soon. 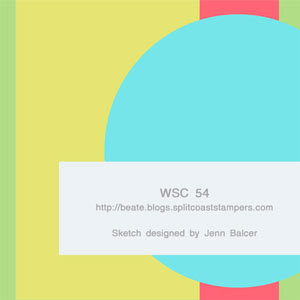 See ya Friday for Beate's Weekend Sketch Challenge! Hey everyone. I meant to post before I left, but life and laundry and packing got in the way. A good friend of mine goes to Eagle Crest every year, and this year she invited us along. Well, my husband and oldest stayed behind to work, but me and the other three kids are along for the ride. We took off yesterday morning and after about a four hour drive we arrived. It is breathtakingly beautiful. The weather is perfect, the kids are having a blast in the pools and bike riding. I am enjoying the peace and quiet and comfort of the condo. From the top balcony, we can see the snow topped mountains... it is awesome! I will post photos when I get home. So, I've been meaning to post about a new product that I recently got. You all know how much I love my Scor-pal. And, for the record, I do not get paid or compensated when I post about products. Of course when you are on a design team, you get the stamps for free, but as far as posting about products, I only speak the truth about how much I like or dislike them.... well, there isn't much I can say that I dislike... yet. But, some products are above and beyond cool. Of course they are my opinions only. The Scor-pal is one of those tools that I honestly use EVERYDAY and has made my paper crafting life SO much easier. So, the other day, I got the Scor-mat. I was thrilled when I heard that Diana was in the mist of designing this. I often start by scoring my card and then end up leaving it out and coloring or finishing up my project right in the tray. The Scor-mat is AWESOME. It fits right inside the tray, one side is a self-healing, the other is a hard service. PERFECT for stamping on or working on your projects. SO, I have to tell you, when packing up my van for our trip, I was debating on whether to bring any stamping stuff, but I threw in my Scor-pal, Scor-mat and some Copic Markers along with some stamped images all into my Scor-Pal bag. It took up very little room, it's light weight and I can sit and color right in my lap while watching the kids in the pool. How cool is that? I'm thrilled. I love you Diana Crick!!!! Okay.. enough gushing about my awesome Scor-mat. I'm going to be in heaven until Wednesday, then we head back to the coast. On Thursday my youngest, Averie, will turn 6 years old..... I am in denial that she will be gone to school all day in September. We are celebrating her birthday this weekend at the cabin and she can't wait. It will be a busy week indeed. So, I won't post again until Wednesday or Thursday. I got an email from a super sweet reader that said she worries about me, or that something had happened to my Grandma when I didn't post for a few days. How sweet is that? Man, I have met the nicest people of my life in this stamping hobby of mine. So, don't worry, I'll be back, I'm just taking a little break and having some fun with the kids before the school schedule is upon us. Thanks SO much for stopping by and visiting me...... and you know your comments make my days! Thank goodness for Internet and Brad's laptop, I did place my first SU! order out of the new catalog, so I will have that to look forward to next week. Oh, I'm in trouble... I want it all. It's madness I tell yah. Okay..... back to the pool with the kids. Have a great rest of the week!! This week the Hanna Challenge is a sketch challenge! Come on over to the Hanna Member forum at SCS and join us! I've had this image colored since I got my atyou Spica glitter pens...... I think my Riley witch was waiting for this sketch. I do that a lot since I got my Copic markers. I'll color in images, then leave them (nice and neat in a little snap on container) until I need them for a certain card, or I see some designer paper that just calls to them. I haven't had so much fun coloring since Kindergarten. I guess now it's all about the glitter baby. Between the Spica pens and the Shimmerz paint, I can't help myself from adding some shine and shimmer to my cards. I seriously... can't help myself. It's a sickness..... really, it is. LOL. The sentiment is a new single from Lizzie Anne Designs witch....get it... witch (told ya I'm a dork), I had to have it since I LOVE Halloween witches. 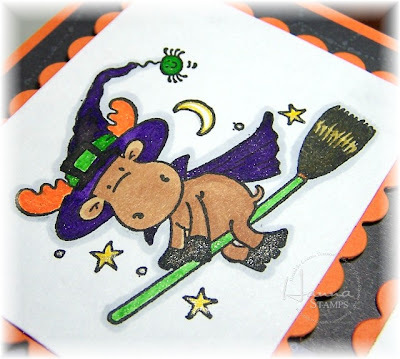 I used some retired Halloween paper from Stampin Up! along with some Bold Bright Brads to finish it up. 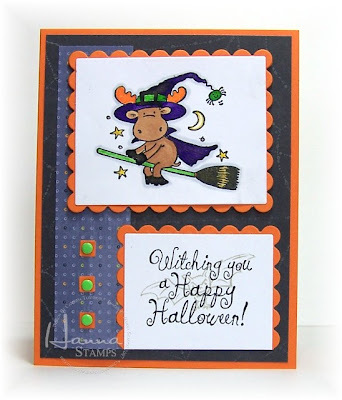 Stamps: Witchy Riley (Hanna Stamps), Halloween Mini (Hanna Stamps) Witching Halloween Sentiment (Lizzie Anne Designs). Paper: Only Orange, Whisper White, Halloween Designer Paper (SU!). Ink: Brilliance Graphite Black, Copic Markers. Other: atyou Spica Pens, Dimensionals, Nesties, Cuttlebug, Bold Bright Brads, Square Punch, Crafter's Tool Kit, Scor-pal. Hope you have a great weekend..... and you can squeeze some time in to stamp! Thanks for stopping by! Hope Your Holiday is Frosty and Sweet! Ha... 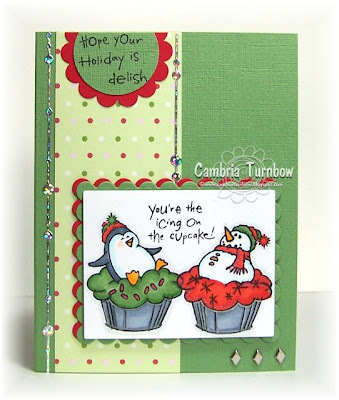 I totally love the sentiments in this new set from Stampendous. I know it's hard to see in the photo, but on the tin window stamped in White Stazon, it says, "Hope Your Holiday is Frosty and Sweet!" Frosty and sweet... indeed. This set is brand new, and you can only get it from eP. It's called Merry Muffins and it's SO cute! Today! You can get it today! Oh, Fridays are indeed awesome aren't they? I think I will add some chocolate, covered with matching designer paper and also make a matching designer paper gift certificate holder. Sorry I didn't get it all done, but you get the picture. 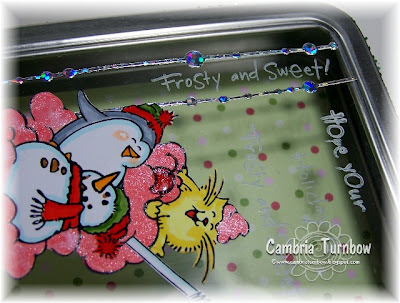 The side of the tin is all glitterfied with Celery Chunky Glitter from Stampin' Up! I used my favorite Scor-Tape to make it sick. The paper on the bottom inside is from Heidi Grace (Jolly and Bright) and the paper on the outside is from a 8x8 stack my Aunt shared with me called Rose Colored Glasses (GCD). The paper on the clipboard is also from the Jolly & Bright line. Can you see the little charm? Yep.... I got out my shrinky dinks! I totally forgot how much fun it is to shrink up charms. I used Black Stazon and colored with the atyou Spica Glitter pens. OMGosh... when it shrunk up, it turned even more sparkly! I LOVE those pens! I punched the hole with my crop-a-dile, then stuck my stylus in the hole to hold it still while I zapped it with my embossing gun. It shrinks all up and you think it's stuck in ball... but just keep that gun going and it will straighten out and end up perfect! This will be such a fun gift to give and you can put a ton of different goodies in there. You can see in the photo the Shimmerz Glitter Paint I used. This color is called Bubble Gum Pink. I used the Royal Red on the cherry, then added Glossy Accents to the top so it stands out. The cool sparkly dot line stickers are from Stampendous too.... the shine is unbelievable and the silver really makes the tin gorgeous! How did I get the image stuck to the front you ask? Back when I was a guest designer for Gina K., she sent the design team these cool labels. I'm not sure what the material is, but it's awesome. After you stamp and color, it's permanent. You can even run water over it and nothing will smear. I used one of the labels, then cut the image out, then peeled the back off and stuck it down. Easy peasy and it looks perfect from the backside too. 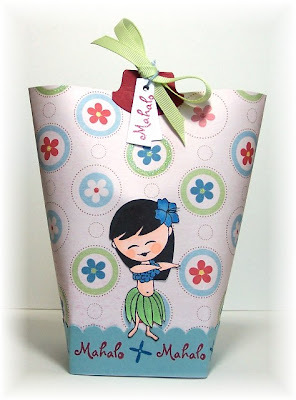 Paper: Heidi Grace Jolly and Bright, GCD Rose Colored Glasses, Waterproof Labels (Gina K.). Ink: Ranger Distress Black Soot, Black Stazon, White Stazon, Copic Markers. 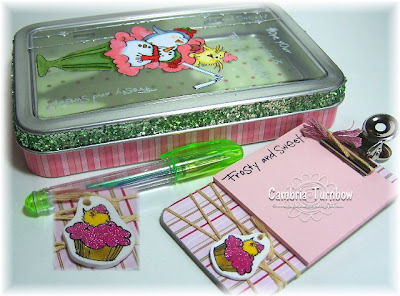 Other: Stampendous Clipboards, Window Tin, Stampendous Stickers, atyou Spica Glitter Pens, Glossy Accents, Celery Chunky Glitter (SU! ), Scor-Tape, DMC thread, Shrink Plastic, Stylus, Embossing Gun, Crop-a-dile, Shimmerz Glitter Paint, Aquapainter. Have a great Friday everyone! Thanks for stopping by! 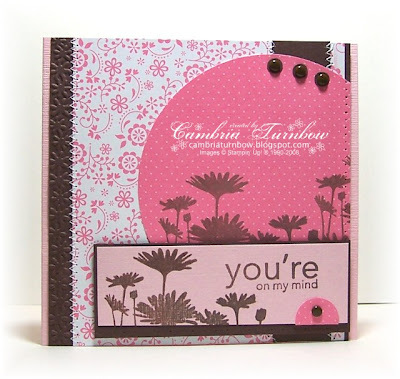 Tomorrow eP is having another exclusive deal from Stampendous. You are not going to want to miss out on this one! I am in love with Merry Muffins! I'm not kidding, this set is SO much fun. The muffin bottoms are separate from the tops so you can stamp different characters on top. There is also a big soda glass with straws! And, of course lots of options for sentiments. Paper: Wasabi Textured, Heidi Grace Desinger Paper, Neenah White, Real Red. Other: Stampendous Dot Line Stickers, Nesties, Cuttlebug, Dimensionals, Vintage Brads, Crafter's Tool Kit, 1 3/8 inch Circle Punch, Round Scallop Punch, Shimmerz Celery and Royal Red Paint, Sakura Glaze Pens. Better late than never right? I stayed up late on Thursday to finish this card for the Hanna Challenge, then took off Friday morning for the lake and didn't photograph it, then the rest of the summer days took me ransom and it didn't get done till now. 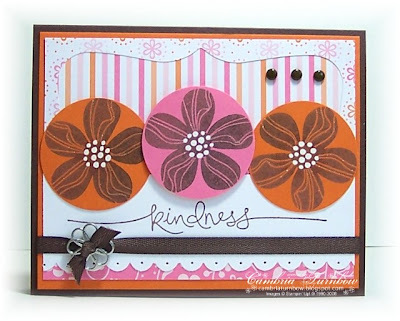 I'm sorry...... last week's Hanna Challenge was from my friend Bethie and it was to use buttons on your card. This is a flap card, so there is a magnet under the Trick or treat that holds the flap closed. 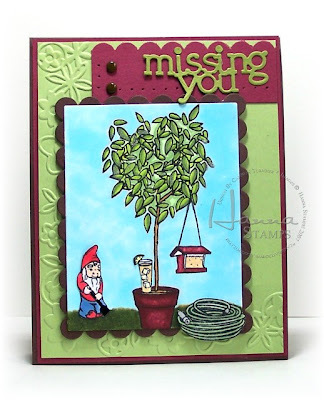 You can see a very cool tutorial by Rose Anne Reynolds on how to make these over at the Scor-pal. This tutorial is here. Have you been over to Scor-pal to see all the cool projects? I love Diana! 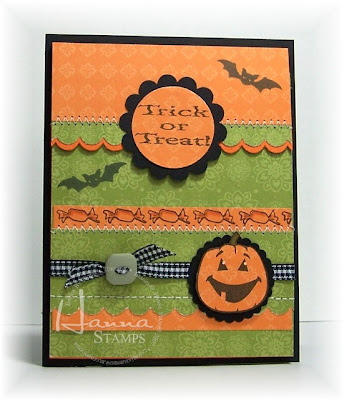 This is the new Halloween mini set from Hanna Stamps. I love that pumpkin and there is two bats! One is solid the other is an outline with the cutest Halloween face! I can't believe summer is coming to and end... it will be Halloween before ya know it!! Paper: Bali Breeze Designer Paper, Basic Black. Other: Round Scallop Punch, 1 3/8 inch Circle Punch, Marvy Round Scallop Punch (yellow), Scallop Edge Punch, Black Gingham, Old Olive Button, Mini Glue Dots, Small Magnetic Snaps, Scor-Pal, Janome Sew Mini. Have a super day everyone! Tomorrow I'm going to show you some sneak peeks from the new eP exclusive! OMGosh...... just wait till you see. This one is my favorite so far! I can't help myself, these bags are so much fun to make! Again, I'm using up the last bit of paper from the A Shore Thing line by Imaginisce. You can't see in the photo, but there is glitter and embossing all over the paper and the hula girl has a matching glitterfied skirt, thanks to Shimmerz celery paint. You can see the full description of this project by visiting Lizzie Anne Designs Project of the Month. The tutorial you can see here. Sorry I've been MIA lately. It's August and the kids are keeping me busy for sure. The days go by too fast. Tomorrow I will post my Hanna Challenge card for last week. I've had it done, I just need to photograph it..... I know, now it's almost time for another challenge. Sorry about that. And, I've got a sneak peek of a new eP exclusive that is TO DIE FOR CUTE coming soon! Oh, my..... I think this one is my favorite! 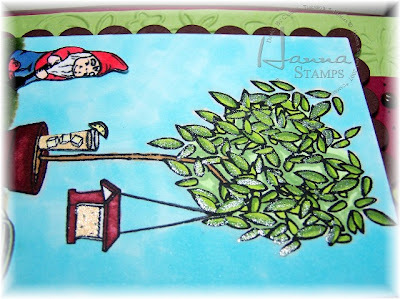 I'm still awaiting the new Stampin' Up! catalogs...... WHERE IS MY UPS man? It's torture. Okay... off to get my girl to her swim lessons. I'll see you tomorrow!